South Dakota State Representative Elizabeth May is currently pushing a bill to establish a “Right of Publicity” in South Dakota’s legislative body. The legislation was inspired by Pearl Means’ efforts to establish a museum honoring her late husband, American Indian Movement leader Russell Means. It seeks to prohibit unauthorized commercial use of a personality’s right of publicity and allow for the collection of damages if said persona were to be unlawfully profited off of. Factors such as a figure’s name, voice, and appearance would be barred from commercial use without direct permission from the personality. 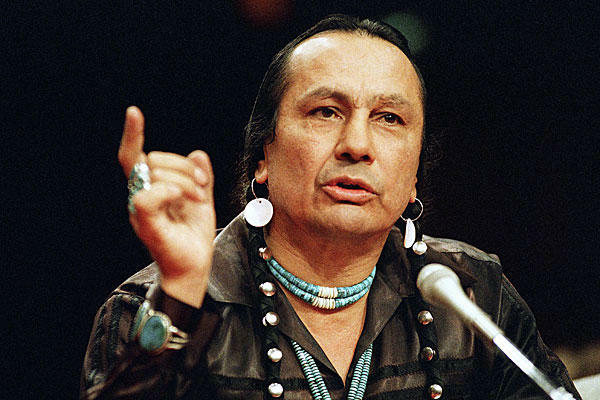 Russell Means was a key player in the fight for Native rights in the late 20th century. His work on the front lines of the American Indian Movement made lasting impressions on Native activism. Later in life, he appeared in films such as “Last of the Mohicans” and “Natural Born Killers.” Means died in 2012 at age 72. Lakota People’s Law Project has met with Russell Means on several occasions and his wife, Pearl, is currently on our board. As such, we are committed to any bill that protects his impressive legacy. In last week’s Senate meeting, representatives from the Motion Picture Association came forward in support of the proposition. Opponents included members of national sports associations. We remain hopeful that a compromise can be found to honor public personalities with integrity while staying while recongizing the complexity of modern media. The Lakota People’s Law Project supports Pearl Means’ museum plans and wishes a clear path to fruition for her and her family. Russell Means is my hero.The man was FEARLESS! He didn’t fear bodily injury,incarceration, or even DEATH!We need more people like him in the world today.He not only fought for native rights in America, but also in Nicaragua. I cross my fingers for you. The white Gov´t is trying to hush up a part of American history because they are afraid the AIM is rising up one day again.